It was just another normal day for Oreo the puppy. When her human left for the day, it was time to get to work. Exploring the house, sniffing around for fun things to play with, searching for yummy shoes to chew…and apparently, getting into things that she shouldn’t have! She came home after a long day only find that her bright white puppy was no longer bright white. She didn’t recognize the grey dog that bounded over to greet her at all, but that signature spot on the top of her little puppy head told her that her eyes were telling the truth: her dog had found something to play with…and it wasn’t her shoes. Little Oreo had gotten into a bag of charcoal and played…and played…and played! Until her entire body (and most of the house) was covered in dark gray soot! Several baths would be needed…and her house wouldn’t be very clean for a while. 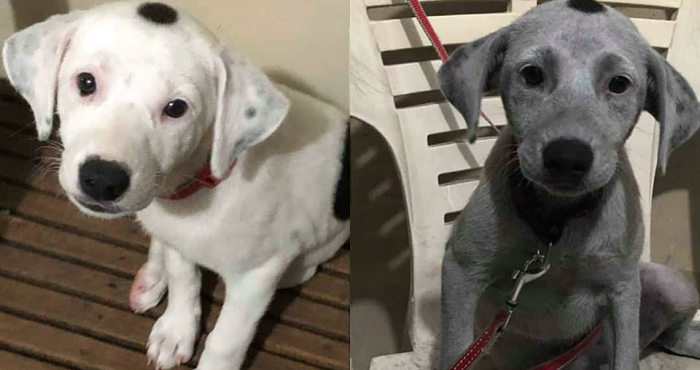 Next time you decide to leave a puppy at home, make sure the bag of charcoal is far, far away!